Have you ever heard of an alligator pepper? Have you ever seen the alligator pepper? 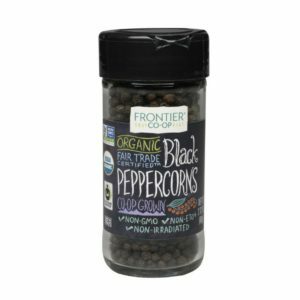 Have you ever used the alligator pepper? Okay! Peradventure you don't have a clue about this awesome spice, what about its close relative ~ grain of paradise? If yes, kudos! Otherwise, you are definitely missing out on this amazing gift of nature. But before shedding light on some amazing things you stand to gain from this unique pepper, let me just quickly point out that we should count ourselves lucky for having numerous essential plants in our ecosystem. The point still remains that most plants are in use today due to their edible, medicinal and therapeutic properties. Basically, their medicinal attributes are based on some chemical substances that offer crucial physiological activities on human bodies. The most significant of these chemical constituents that are supported by researchers to be mostly secondary metabolites are flavonoids, tannins, alkaloids and phenolic compounds. This further led to the overwhelming popularity of herbal products produced specifically from these medicinal plants. Alligator pepper is one of such medicinal plant that has become of great importance in our lives. Alligator pepper, which is botanically known as Aframomum melegueta is a popular herbaceous perennial plant that is originally from West Africa in countries like Nigeria, Cameroon, Liberia, Cote D'ivoire, Sierra Leone, Togo, Gambia and Ghana. It belongs to the zingiberaceae or ginger family and thrives mainly in swampy habitats especially in the West African coasts. 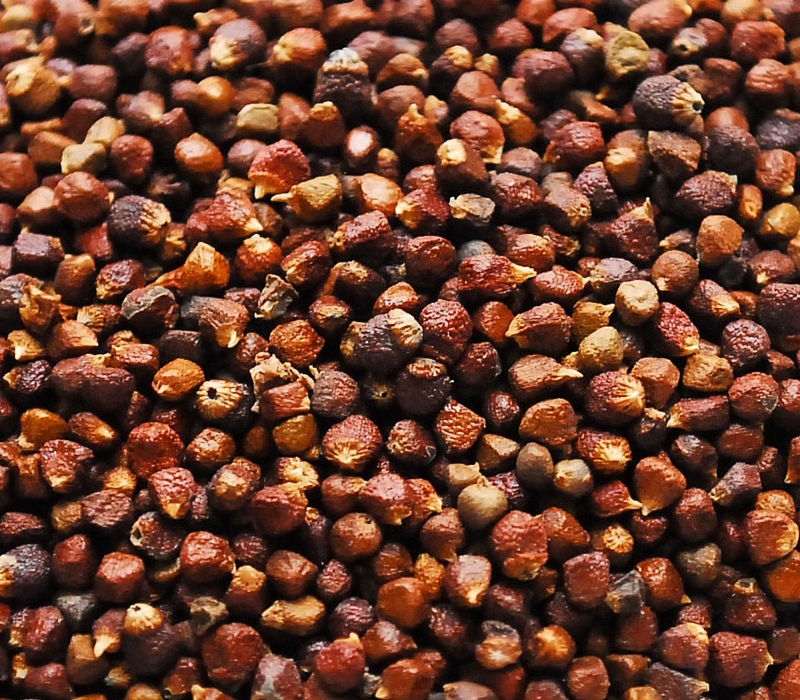 The seeds of the alligator pepper are similar to the grains of paradise however alligator pepper seeds are usually sold enclosed with the pods while the grains of paradise are sold as single seeds. Alligator pepper is also known as hepper pepper, mbongo spice, Afrika kakulesi, melegueta pepper, ginny papper, Guinea pepper or atare. The tree grows about 1 meter tall with narrow lanceolate leaves that have similar appearance with the bamboo leaves. The leaves are located at the base of the shoots on short peduncles with labellum and bracts that enclose the developing flowers. The fruit is distinguished by its ovoid shape with reddish colour when fresh however, the colour changes to brown when dry. The skin of the fruit has close similarity with the back of an alligator and this suggests the origin of its name. The fruit contains many small brownish seeds with sharp peppery, bitter, pungent and aromatic flavour. The fruit encloses the seeds, which are sealed with inner thin papery whitish skin. It's strong pungent, peppery taste is as a result of its aromatic ketones and high tannin content. Alligator pepper is a highly valuable spice as a result of its high medicinal and nutritive values, for example, the phytochemicals derived from its seeds are being used since time immemorial for treating several diseases. 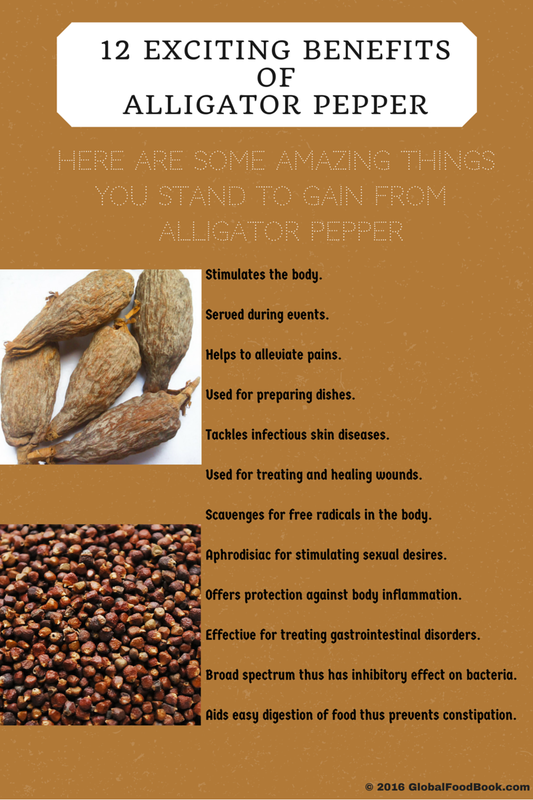 Apart from medicinal purposes, alligator pepper is usually snacked upon and used for culinary purposes. 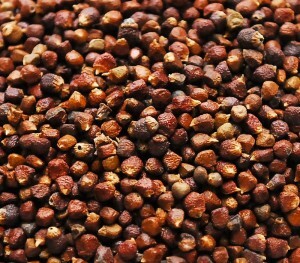 Alligator pepper is a popular spice that is normally snacked upon especially by elders and sometimes youths. 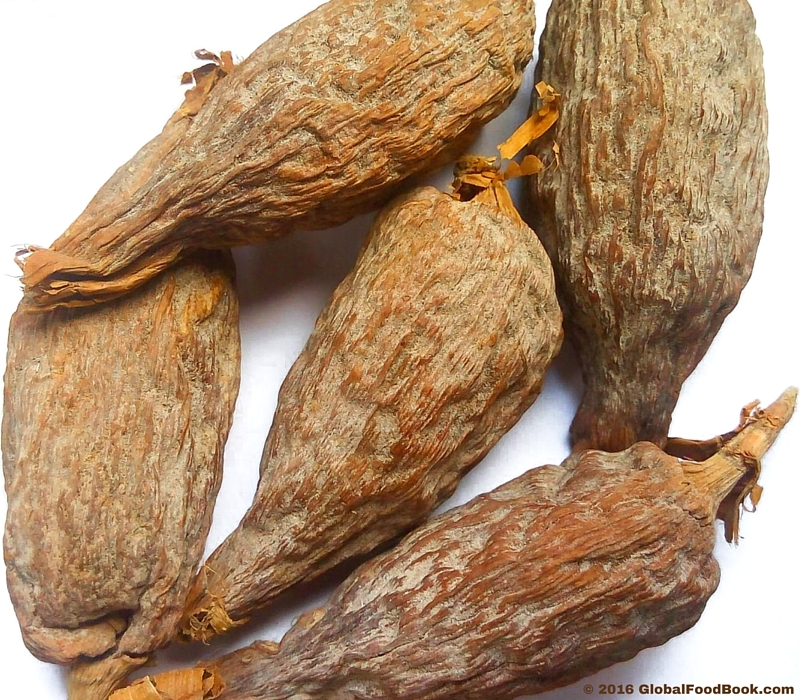 In traditional meetings and events such as baby naming ceremonies, traditional marriages, burial ceremonies, town meetings etc, the alligator pepper is usually served together with kola nuts and peanut butter (ósè ọ́jị́) as part of the customary rites. REFERENCES 1] Ajaiyeoba, E.O. and Ekundayo, O. (1999). Essential oil constituents of Aframomum melegueta (Roscoe) K. Schum. seeds (alligator pepper) from Nigeria. Flavour and Fragrance J.; 14(2): pp. 109-110. 2] Chiejina N. V. and Ukeh J. A. (2012), Antimicrobial Properties and Phytochemical Analysis of Methanolic Extracts of Aframomum Melegueta and Zingiber Officinale on Fungal Diseases of Tomato Fruit, Journal of Natural Sciences Research, 2(6): pp. 10 – 14. 3] Doherty, V. F., Olaniran, O. O. and Kanife U. C. (2010), Antimicrobial Activities of Aframomum Melegueta (Alligator Pepper), International Journal of Biology Vol. 2, No. 2, pp. 126-129. 4] Edeoga, H. O., Okwu, D. E. and Mbaeble, B. O. (2005), Phytochemical Constituents of some Nigerian Medicinal Plants, African Journal of Biotechnology, 4: pp. 685-687. 5] Famuyide, O. O., Adebayo O., Bolaji-Olutunji K. A. and Oladeji O. (2011), Marketing Efficiency of Garcinia Cola (Bitter Cola) and Afomomum Melegneta (Alligator Pepper) In Ibadan Metropolis, Oyo State, Continental Journal of Agricultural Economics, 5(1): pp. 23-28. 6] Fernandez X., Pintaric C., Lizzani-Cuvelier L., Loiseau A. M., Morello A. and Pellerin P. (2006), Chemical composition of absolute and supercritical carbon dioxide extract of Aframomum melegueta. Flavour and Fragrance Journal, 21: pp. 162–164. 7] Igwe S. A., Emeruwa, I. C. and Modie, J. A. (1999), Ocular toxicity of Aframomum melegueta (alligator pepper) on healthy Igbos of Nigeria, Journal of Ethnopharmacol. 65(3): pp. 203-205. 8] Inegbenebor, U., Ebomoyi, M.I., Onyia, K. A., Amadi, K. and Aigbiremolen, A.E. (2009b), Effect of Alligator pepper (Zingaberaciae Aframomum meligueta) on gestational weight gain. Niger. Journal of Physiological Science, 24(2): pp. 165-169. 9] Inegbenebor, U., Ebomoyi, M. I., Onyia, K. A., Amadi, K. and Aigbiremolen, A. E. (2009), Effect of Alligator pepper (Zingaberaciae Aframomum meligueta) on first timester pregnancy in Sprague dawley rats, Nigerian Journal of Physiological Sciences 24 (2): pp. 161-164. 10] Kamtchouing P., Mbonge G. Y. F., Dimo T., Watcho P., Jatsa H. B., Sokeng S. D. (2002), Effects of Aframomum melegueta and Piper guineense on sexual behaviour of male rats. Behavioural Pharmacology, 13: pp.243–245. 11] Uloneme, G. C., Anibeze, C. I. P. and Ezejindu D. N., (2014), Effects of lactational exposure to aqueous solution of Alligator pepper (Elettaria cardamomum) on litters of lactating Wistar rats, International Journal of Phytopharmacology, 5(3), pp. 227-229. 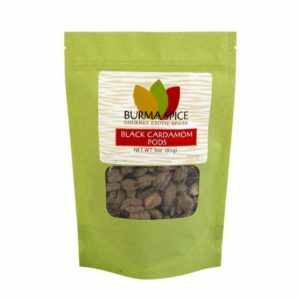 Where to Find Grains of Paradise, Pepper Corns or Black Cardamom!! !